Ok, so my mom was NOT terrible cook; best spaghetti sauce EVER, best cream puffs, best holiday meals. But pies were never her thing. I grew up with Pillsbury read-made, ready to roll pie crusts procured from the refrigerated section of Piggly Wiggly, and they just weren’t that great—certainly not the appropriate vehicle for an amazing sour cherry filling, or any other perfect fruit of the season. My grandmother (also no slouch in the kitchen) was no help either, making her pie crusts with oil and flour. They were brittle, pale and tasteless—not exactly a recipe worth passing down to the next generation. Shortly after getting married, I gave the homemade crust the old college girl try. My tragic attempts all seemed to end the same way; with a heap of crumbled dough in the trash and my defeated, greasy hands clutched around a giant glass of wine. What was I doing wrong? 1. You must use shortening AND butter. Butter gives you amazing flavor, but the shortening (which is filled with millions of little bubbles produced during hydrogenation) contributes that tender, flaky texture that everyone wants in a good crust. Lard can yield that same texture, but frankly, I’m just not going there. Yet. 3. An overworked dough is a tough dough. Visible flakes of fat mean that as that fat melts in the oven, it will create little pockets of steam which push the structure of the dough up and out…creating flakes of crust. It’s a beautiful thing. 4. Next to love, an amazing pie is the best gift you can give to anyone. Period. Test this and just you see. Perhaps you are one of the many who have endured the pre-made grocery store imposters all your life. Maybe you THINK you’ve had some decent pie at the church potluck or neighborhood picnic. Forget about all that, and just make this. When you finally realize what you’ve been missing, you may just tear up. You’re welcome. 1. Cut butter into 1/4” pieces and place them on a small plate in the freezer; proceed directly to step 2. 2. In a large bowl, whisk together flour, sugar and salt. 3. Add in cold shortening and blend in by hand with a pastry blender, for a minute or two. There should still be plenty of visible balls of shortening in the flour mixture. 4. Add in the butter from the freezer. Contine to blend until mixture takes on the texture of small peas. 6. Dump mixture onto a large piece of plastic wrap sitting atop your counter. Use the plastic wrap to shape the dough into one solid mass (less direct contact with your warm hands is always better). Divide into two equal parts. Shape each part into a disk, measuring about 6 inches across. Wrap each disk tightly in plastic wrap and refrigerate for at least 2 hours before using. I’ve always found the story of Adam and Eve intriguing. Out of the dust of the earth, God fashioned a man. But to give him a proper companion, God uses a rib from Adam’s body, creating woman. The way I figure it, if a rib was important enough to be included in the story of mankind, we owe it to ourselves to enjoy a heaping pile of them every chance we can get. And hey, it’s a holiday weekend! 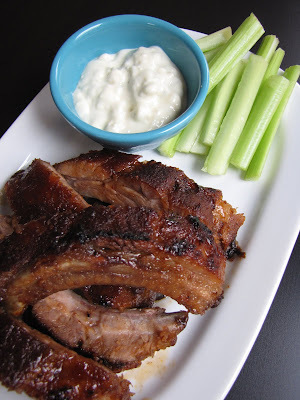 This is my favorite recipe for baby back ribs. The glaze is sweet and spicy, and the slow cooking method yields a fall-off-the-bone, meltingly tender quality that will leave you completely impressed with your mad cooking skills. Best served with a cold Newcastle and some homemade blue cheese dressing and celery sticks. Edible Communities recently published a coffee table book about local food across the country, and I was fortunate enough to contribute two stories to the content. Edible: A Celebration of Local Foods is a beautiful book, and contains dozens of inspiring stories of the dedicated small farmers, culinary artisans, and chefs who make it their business to feed us from the riches of our own land and waters. The book also includes a huge recipe section, not to mention the gorgeous photography characteristic of every Edible publication (there are now 65 publications across the country…and growing). I could go on about the local food movement—about the positive impact on your local economy that results when each person dedicates even a small percentage of their monthly food dollar to local food; about the environmental impact of monocropping, GMO’s and shipping in produce from another hemisphere; about the complex and far superior flavors of an antique variety of apple grown just a few miles from your front door—but I hardly need to say all that. Edible Communities is already doing a great job in that capacity; and now you can read all about it in bookstores everywhere. Cheers! Ever since I had my first taste of posole at El Barzon in Detroit last spring, I have been meaning to try a recipe from scratch at home. This version from Rick Bayless is definitely tasty; the rich pork broth is the color of wet terra cotta, made so by the mixture of toasted red ancho and guajillo chiles. 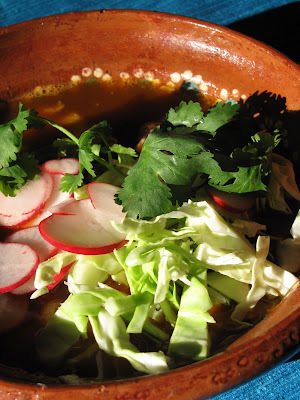 Studded with shreds of pork and fluffly hominy, posole is a satisfying peasant soup. 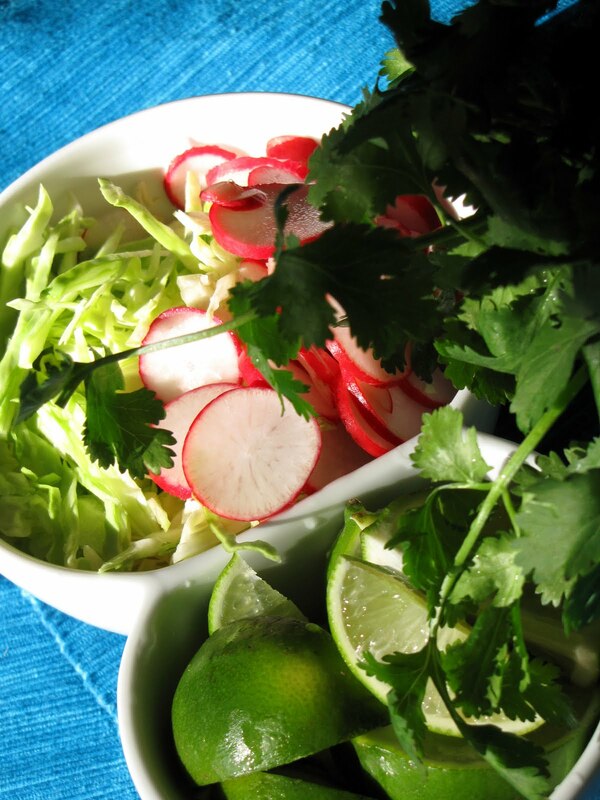 Similar to phở, another one of my favorite soups, posole is simple in and of itself, but you make it your own by adding the condiments you love the most—shredded cabbage, sliced radishes, cilantro, onion, oregano, avocado, or even fried pig's skin. 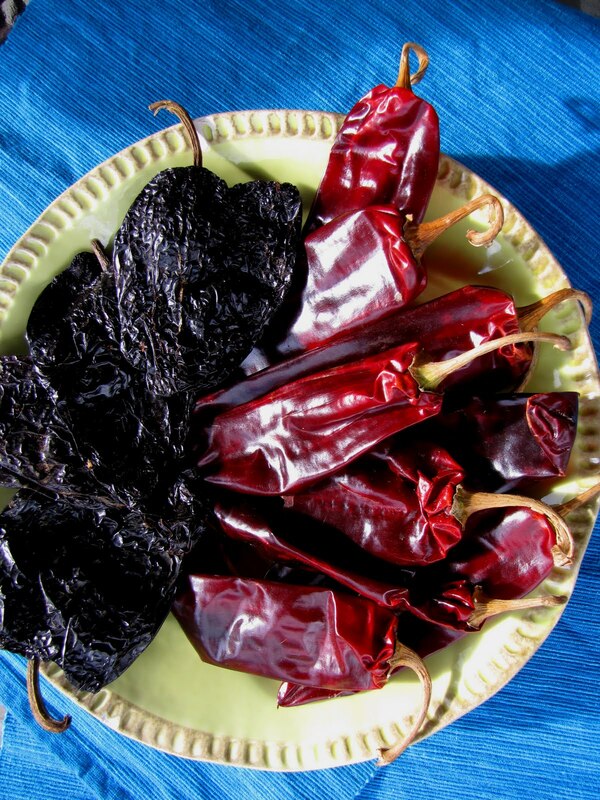 I ventured out to Avanza supermarket on South Federal Boulevard in search of the chiles, as well as pig’s head and feet, which are called for in the original recipe to lend rich flavor to the broth. When I asked the gentleman behind the meat counter if they had pig’s head, he simply replied, “Aisle 8.” Perplexed yet determined, I found the pig’s head in the frozen food aisle, but frankly the thought of letting a cabeza de Puerco thaw in my fridge for a couple days was less than appetizing. Luckily, the meat case back in the meat department had a whole pile of meaty bones designated “pork for posole,” so I settled for a large package of those to serve as the base for my soup. Bayless’ version also calls for using pig’s feet, allowing bits of cartilage and connective tissue to linger in the soup when served. While this certainly sounds authentic, it grosses out my husband (whose idea of authentic Mexican is Chipotle), so I opted to omit the trotters altogether in the interest of marital accord. This soup takes a long time to make—not because it’s complicated, but because the stock needs to simmer away for hours in order to become properly flavored, and at least an hour or two more in order for the hominy to become tender once added to the pot. I guess this is why posole is typically served only on weekends in Mexican restaurants. This recipe is also very mild; if spice is what you crave, I suggest including the seeds when pureeing the toasted chiles (set them aside for pureeing but do not toast them; they will just burn), or adding hot sauce or chopped jalapeños to your selection of condiments. Nevertheless, I’m calling this venture a success. The recipe made enough to feed a small army, and the juxtaposition of warm soup and cool, crispy condiments is perfect to enjoy during a Colorado spring, when the sunny warm days give way to chilly evenings. 1. Make the broth. Place meaty bones and pork shoulder in a very large stock pot. Cover with seven quarts of water; add garlic. Bring to a boil, reduce heat to a simmer and allow so simmer for 2-3 hours. By this time the meat should be completely fork tender and falling off the bones. 2. Meanwhile, tear chiles into large, flat pieces. Toast them (one or two pieces at a time) in a heavy skillet over medium heat until they crackle and blister on both sides. Remove chiles to a large bowl, cover with boiling water. 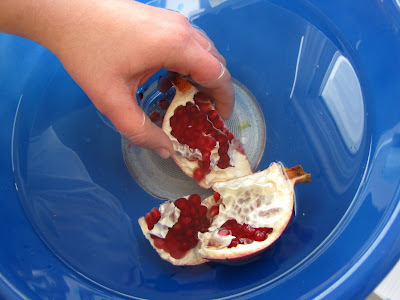 Submerge and soak for 30 minutes; drain. 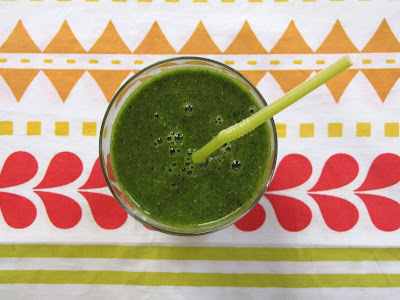 Place in a blender with ½ cup water and blend until smooth. Strain through a sieve into small bowl. Set aside. 3. Remove bones and pork from the stock; shred the meat with a fork, reserving the meat in a bowl and discarding bones, fat and cartilage. 5. To serve, place a bit of warmed, shredded pork meat into a bowl; ladle in soup. Garnish with condiments. In honor of Earth Day, I’m going green. A few weeks ago, I had the pleasure of interviewing nutritional consultant Eloise Nelson for an assignment with Edible Front Range magazine. She showed me how to make an amazing smoothie, packed with fruits and vegetables. This recipe is a variation of hers**, and makes enough for two huge servings—one for breakfast, one for mid-morning snack. It makes you feel clean and light all day long, which is more than I can say for the platter of giant muffins lurking in your typical office break room. Blend again and serve. 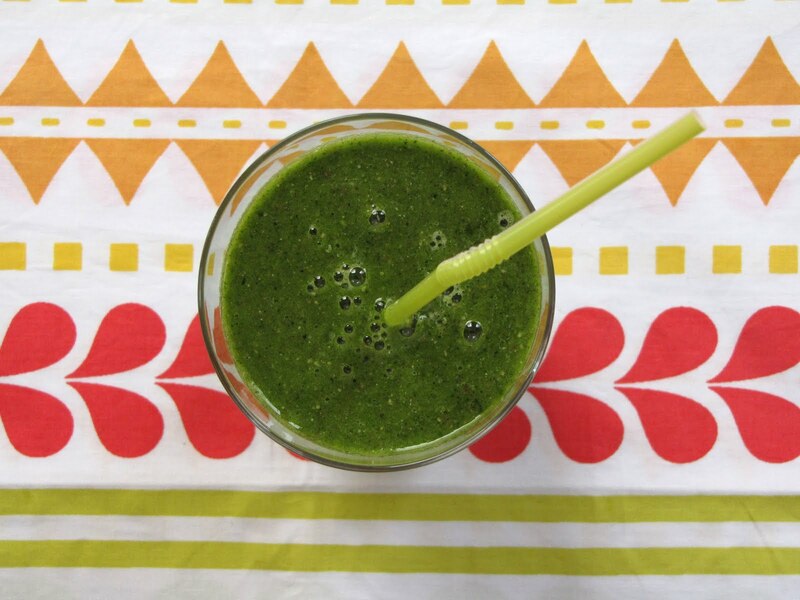 This smoothie is meant to be enjoyed the day you make it. Leftovers oxidize and lose their nutritional value quickly. Sometimes life gets busy. Not so busy that I’ve resorted to Cheesy Blasters—ok, maybe I have spent a lunch or two in the home office with a Lean Pocket and some stale shiraz—but this is dinner we’re talking about. Everyone deserves a dinner good enough to right the day’s wrongs and usher us into our comfort zone (mine involves a big red couch, a second glass of wine and Mad Men on DVD). Shellfish isn’t exactly in the forefront of our minds when it comes to the quick weeknight supper, but it really should be. In about the time it takes for pizza to be ordered and delivered, you can steam up a batch of these mussels in spicy tomato-cilantro broth. Serve them with a cold beer, a salad made from pre-bagged spring greens and a crusty baguette, perfect for sopping up the amazingly flavorful broth. It really is the perfect way to end the day, and much less regretful than, say, inhaling half a Domino’s pizza. You can buy them from the seafood department in your supermarket, found either loose on ice or in one-pound net bags. They should smell fresh and salty, like the ocean, and most of the shells should be closed tight. 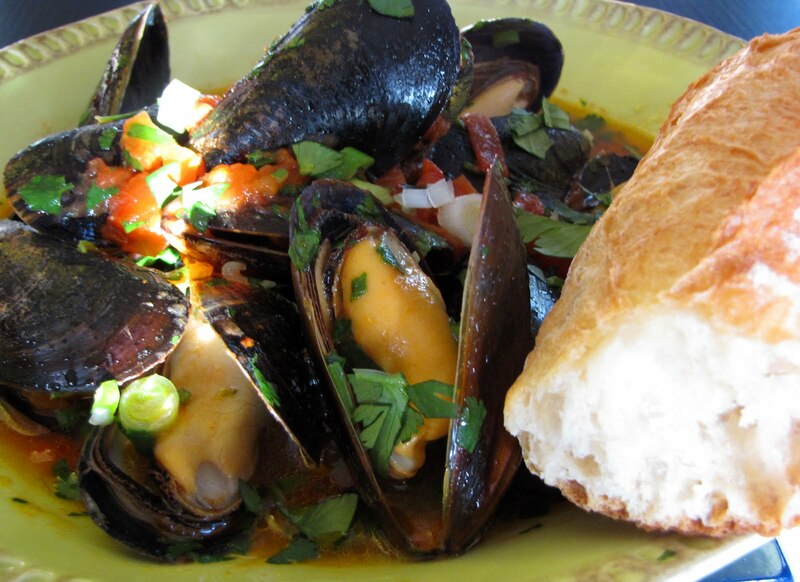 When you get them home, pick out any mussels that have shells slightly open and rap them smartly on the countertop. If the mussel closes back up, it’s alive and fine to eat. If it stays open, the mussel is already dead and should be tossed out. Give your mussels a quick rinse under cold running water (If I have extra time, I’ll give mine a soak in cool water—for up to an hour—just to wake them up a little and let them filter in some fresh water. But that is not necessary.) Now they are ready to be steamed, which takes only 4-5 minutes. Bring first 5 ingredients to a boil in a large pot, stirring occasionally. Add mussels and butter. Cover and cook until mussels open, about 4 minutes (discard any mussels that do not open). Stir in cilantro and green onions. Season with salt and pepper. Divide among bowls and serve with crusty bread. It’s the same old story—on the first sixty-degree day of the New Year, I dig out a few items from my spring/summer wardrobe. I try (tug) on my shorts and skirts, let loose a string of expletives and vow to stop resting in the comforting arms of pot roast and mashed potatoes. With a new resolve, I start investigating fresher dishes that will keep my interest and shave off the layer of winter insulation, readying my legs and upper arms for the light of day. This salad is the first of many to come this season. In a medium bowl, combine sliced fennel with a drizzle of olive oil and the juice of one tangelo. Season lightly with salt and pepper, tossing to combine. 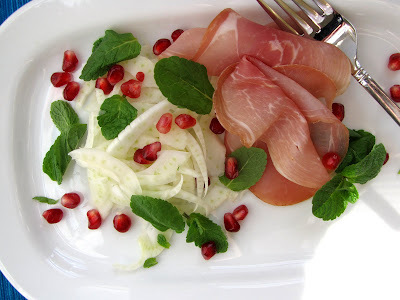 For each serving, arrange a helping of fennel and two slices of prosciutto. 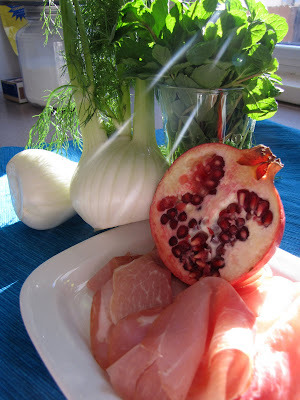 Garnish generously with a handful of fresh mint leaves and pomegranate seeds.